A unique blend of Herbal extracts that have powerful protective properties. Helps to protect the skin from the hazards of environmental exposure. It is specially formulated to cleanse the skin from the depth of the pores. 1. Treats your skin from dryness, blackheads and makes it shine.2. Exfoliates the skin.3. Reduces fine lines.4. It has an Anti - Aging properties. A unique range of diamond ash and other ayurvedic contain made for 15 minute and clean with wet cotton. Apply galvanic machine if require. Mrigoy Diamond facial kit provides natural glow with essential nutrition to the skin. It is enriched with free radical fighting agents. Mrigoy Diamond facial kit helps to exfoliate dead cells and removes dirt from your skin keeping it clean and safe. Mac Personal Care Pvt. Ltd.
kit Contains : Diamond Bhasam Cleanser 50ml, Diamond Bhasam Scrub 50 ml, Diamond Bhasam Gel 50 ml, Diamond Bhasam Massage Cream 50 ml, Diamond Bhasam Pack 70ml. 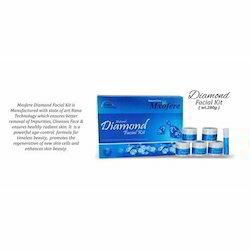 We are the prominent manufacturers of Diamond Facial Kit that helps in detoxifying the skin whereby improving blood circulation, complexion and gives perfect radiance look. This diamond facial kit is made using best quality material that ensures the efficiency of the product. The Kashmeer Moonshine Diamond Facial Kit is very effective against skin problems. Cleanser, cream, gel and a face pack with aromatic properties of natural ingredients are included in the kit.